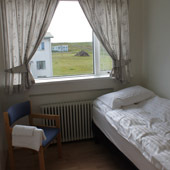 Nest Guesthouse is quietly located in the northern fishing village of Raufarhöfn – the Arctic Circle Village. 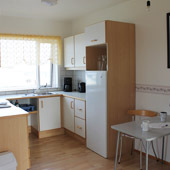 Ideal for a peaceful stay to enjoy walks, fishing and the midnight sun at the edge of the arctic. The area around The Nest, Melrakkaslétta plain is renowned for the natural splendour of its spring and summer nights, a large number of lakes and rich bird life. Ideal location for the spectacular northern lights display in the winter months. At the northern extremity of the plain is Hraunhafnartangi point, Iceland’s northernmost extent. The Arctic Hengeat Raufarhöfn is under construction; a huge stone structure with allusions to mythology and folklore, designed to interact with the unique natural light. Got one extra to stay? we have an extra bed.